What size should you make your ebook cover? There are many devices with different size screens. The “experts” recommend five sizes: 600x800, 1876x2500, 1600x2400, 1440x1920, and 1400x2100. Um ok? Which size do you pick? The choice is easy. Ask yourself this question: Do you want your cover squished? No, you don’t. So you should make different sizes for each platform. A one-size-fits-all approach will not work for your ebook cover. Let’s take a look at the specs from each of the vendors. All the official specs from the Apple, Amazon, and Barnes & Noble are very confusing. Um. ok. Amazon dances around with different ratios and one-dimension sizes. Barnes & Noble gives you nothing. Apple gives you five different dimensions. What should you use? Keep your width the same at 2500 pixels and vary the height according to the device. I would design with the iPad size first. Then you can build your design knowing that it needs to also be an additional 668 pixels higher. Notice that the design sizes are bigger than the embed sizes. The beauty of this is that the embed sizes and the design sizes are the same aspect ratio. Start with the larger design size for each device, and then when you shrink the image down, it will fit the exact size for the embed size. How did I arrive at these dimensions? I used three pieces of criteria to decide the size. Let’s take a look at each device. 1200 x 1920 (1.600 aspect ratio) Kindle Fire HD 8.9"
800 x 1280 (1.600 aspect ratio) Kindle Fire HD 7"
Thoughts: The 1.6 ratio is spot on with the Kindle Fire HD. But the e-ink Kindles have ratios of 1.33 and 1.456. I’m guessing that the e-ink Kindles will letterbox the left and right sides of your cover. 600 x 800 embedded cover. This blog author prefers 600×900 which is the size of print books. Both of these experts recommend 600×800 for the Kindle embedded cover, but that’s a 1.333 ratio. 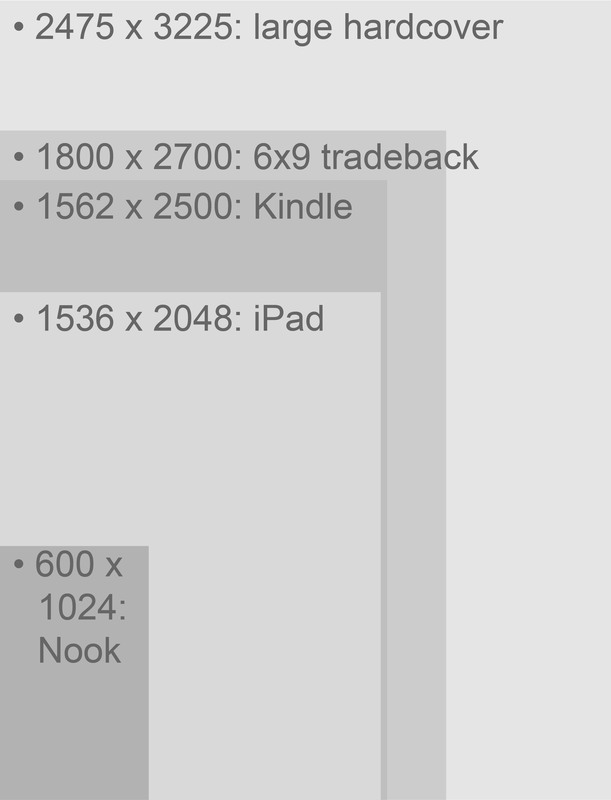 Why would amazon want 600x800 for the embedded when they specifically say they want a 1.6 ratio? Stick to the size Amazon asks for: 2500 on the longest dimension with a 1.6 ratio, which means 1562x2500. The incredibly hard captcha forms on Blogger defines its brand. That’s a great point, 50interviews. A 6×9-inch paperback at 300 dpi would yield a file 1800×2700. Perhaps I should change my standard width to 1800 pixels wide. And then throw in the print version as 4th format in my diagrams/lists. I set the width standard to 2500 pixels. Just a tad larger than the largest hardback lulu.com offers. All the templates and sizes on this post are changed. A big thanks to 50interviews for the suggestion to integrate print sizes into the mix. One of the things I don’t like workgin at 2500x4267px is that in InDesign, you have to work with the document set to 5-10%. And the font sizes end up being about 140 pt to 400 pt. Just a bit awkward. Awesome post! I had this exact question and you answered with great detail. To your knowledge, Matt, are these vender “requirements” still true a year after you’ve written this post? I’ve looked around and they seem to hold up but it’s getting harder and harder to tell what is the official documentation for these sorts of things. P.S. Browsed through your blog a bit and it’s all very interesting. Glad I discovered it. Wilforbis, thanks! Yeah, I believe these are still to be accurate specs. 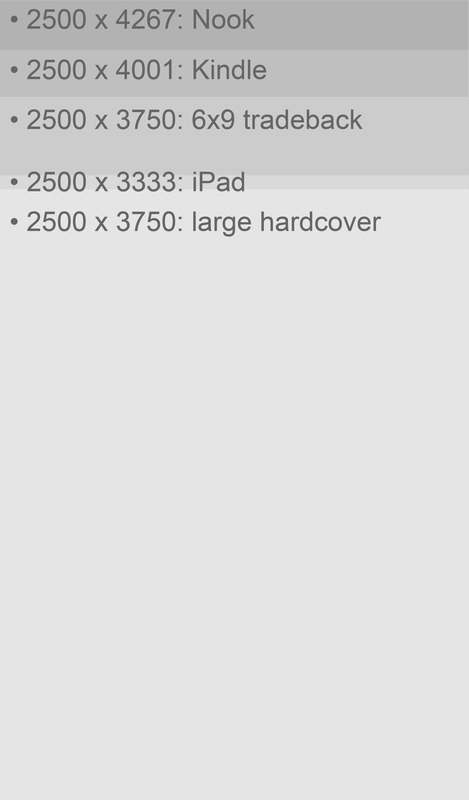 We continue to produce ebooks at work, and I haven’t heard of any issues with our covers built to these specs. I’m glad you enjoyed my blog. I hope to see you on here again. I just skimmed through your “Hands-Free Computing” article. Wow, also very in-depth. Thanks – that article probably needs an update. If I were to boil my advice down in that realm it would be: use Dragon combined with the Vocola software. That’s where you really see the efficiency gains. This was incredibly helpful. I wish I had found it earlier. Thank you! Wow!! This is the best information I have been able to find on this topic. You broke it all down fantastically. Thank You! !